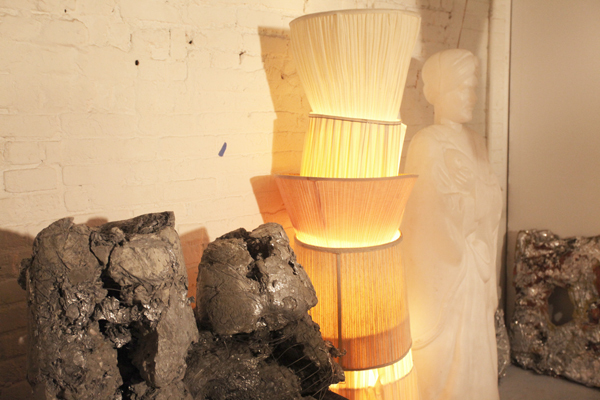 James Payne is a sculptor with a particular interest in light, space, and texture. 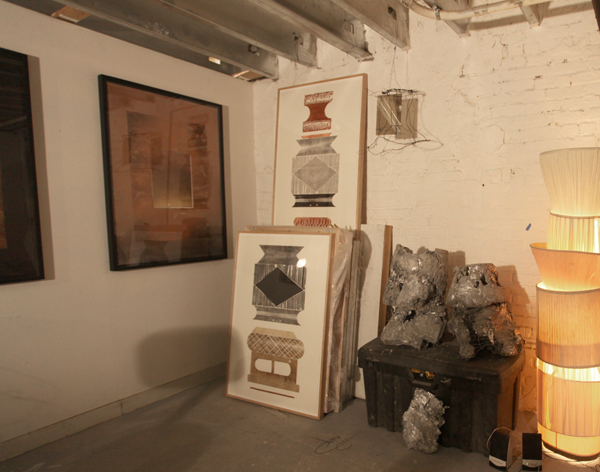 We’ve visited his studio several times before while James was working, but for this visit, he cleared out his in progress concrete molds and set up his space to showcase his more completed works. 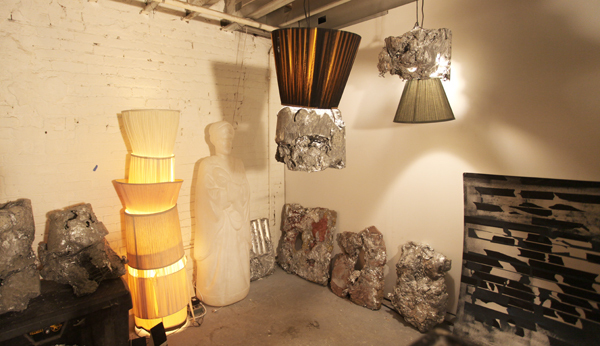 The only sources of light in his basement studio, came from his concrete light pieces and a single clamp light to illuminate specific works during our conversation. 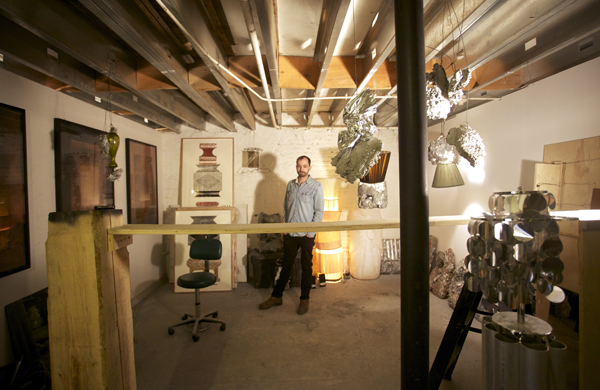 James went to Bennington College for Architecture and Sculpture and received his MFA at the Cranbrook Academy of Art for Sculpture. James is currently living and working in Brooklyn, New York. His studio is located in the same building as Michael Aitken’s. F: Did you go to school originally for printmaking? JP: Actually I did my ungrad in Vermont at Bennington College and I did mostly sculpture and architecture. 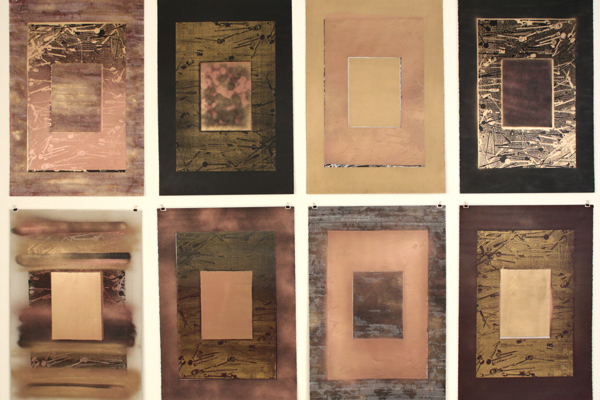 At Cranbrook I did mostly sculpture but in my last year, I did a lot of printmaking. F: Why did you choose to focus on printmaking in grad school? JP: I started to work with flat image when I was at this residency in Michigan. I did these prints first. They’re relief woodcuts. Then when I got back to school, I tried a different process with silkscreen stencils and layered image and I sort of tried getting back to where the light-based work is. I see these as related to the light-based installation in terms of capturing direct light and atmospheric field and the process of layering the screens. I’m working towards how the viewer perceives perceptual shifts within a flat image and using a lot of metallic inks and paints to achieve these effects. F: The materiality of the inks are very integral to the piece. It makes it very object oriented in a way. 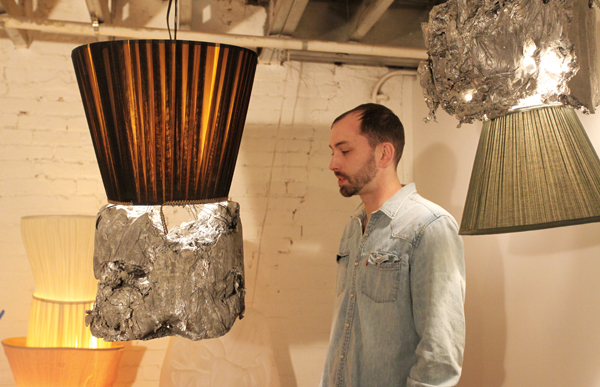 JP: They’re definitely more dimensional and I’m working on making them ephemeral in a way. 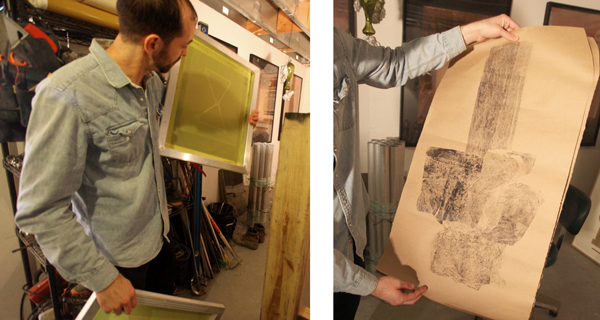 F: Did you create the light-based work with the lampshades before the prints? JP: I’m sort of getting back into this work right now. In my first year of grad school, I pretty much only worked in light-based installation. A lot of it started with a loose collection of objects or materials (a lot of porous and reflective skins and membranes, screens and 2 way mirrored glass) that sort of become the work. My studio is in a dark basement, and my first year of grad school it was too. I had complete control over my environment in terms of light and so I just started moving lights around to figure out where I wanted to go. F: It’s interesting though that you have come back into a basement setting. Has it attracted you? 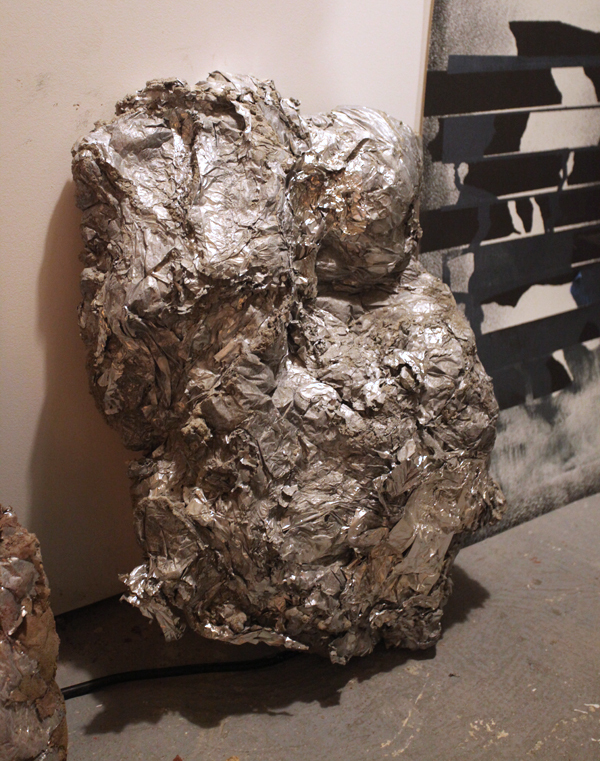 Your materials are so heavy and enclosing and the space that you work in reminds me of a place or a big part of your concrete and aluminum sculptures. JP: Yeah, it’s nice to be back in an enviornment where I have control over the light and it has gotten me back into working in this way. I’ve really been thinking about light and perception and more moments of – I can go after a paticular moment of a perceptual shift or a condition of light that I am interested in and work with it and push it. With the concrete and foil, I made a little work in grad school but I never really pushed it and so I’ve had some ideas about how to pick it back up. They’re becoming more volumetric now. 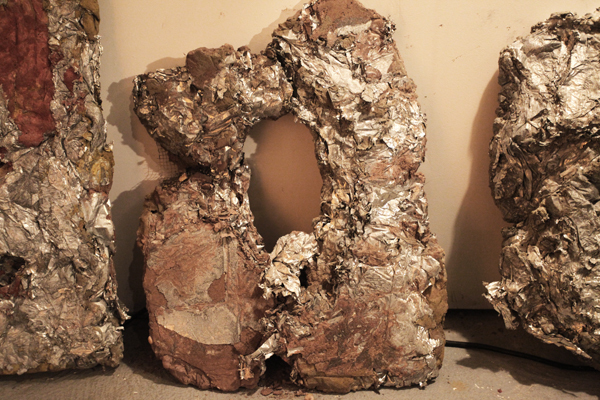 I’m using the containers I’m casting them into and the foil itself in a more volumetric way. Both things sort of find their own volume and form when I set up some conditions and parameters for working with the material. 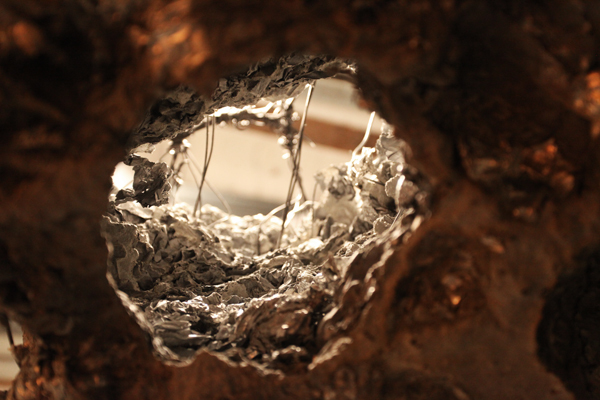 The heaviness or gravity of the concrete interacts in its own way with the fragility and sensual aspect of the foil. F: It’s interesting. We were talking earlier about the duality of your work, and how it has this light and this kind of ephemeral-ness juxtaposed with this extremely heavy material in terms of the volume and the way the viewer looks at these things – vaciliating between the two extremes. The prints also relate to this juxtaposition. Can you talk about that a little bit? 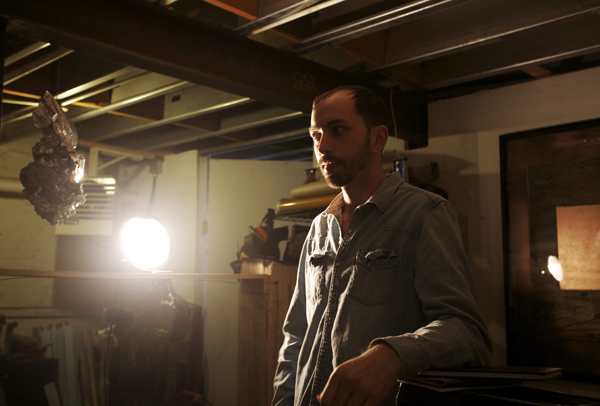 JP: The solid mass sort of plays off of that relationship with the light being ephemeral. 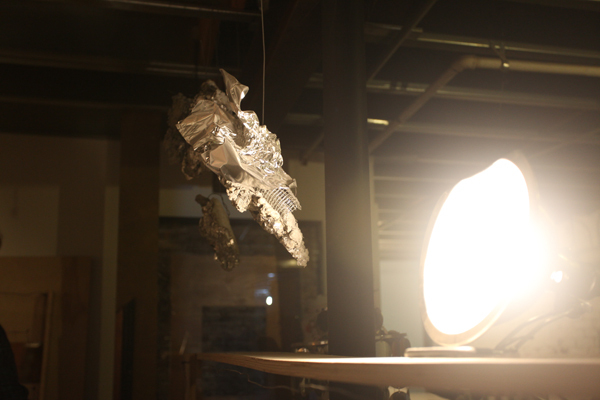 Suspending the pieces help deal with the gravity of the objects and complicate it. F: They pieces are hung at this very specific height. It’s kind of at a human scale and the pieces become extremely apparent when they’re hung up versus when they’re rested on the ground. It’s almost as if I see certain personification aspects to them like this totem lampshade becoming a body. Each of these things to me represents, and I think it has a lot to do with the light, but these kind of stand ins for something or someone or representations or at least a nod towards representations of the figure. It’s really interesting especially when it comes down to the material as material which seems to be the opposite – how it melds together so well. You have also been working with the wooden peices for a long time ever since you moved to your studio. JP: I worked alot with frames and framing as a device especially with loosely organized objects, artifacts and materials that help give it context. I became interested in frames and framing in arcitecture which also has a lot to do with the study of light. I look a lot at how architects use light as well as landscape painters. I was just looking at this Turner, Whistler, Monet book today. I saw the show in London in 2005 and they all have this relationship to how they paint light. Monet is with an almost textural way with gesture and with Whistler, it’s more dark and emotional and with Turner, it’s ghostly. These are all things that I’m looking at in my work in terms of light. F: You can describe light so many different ways. JP: They’re all painting the same thing but there are slight differences. The frames in the painting are something that I’m working on. This is a raw frame and I’m okay with leaving it like this for now. I see my studio as a testing ground, trying a lot of different things, pushing things around, figuring out through trial and error and looking at the paticular moment or condition of light and framing. F: You mentioned when talking about these pieces, your architecture background and just in general with all of these the materials, they’re used in the creation of – building supplies. They’re almost all contruction materials, and I know you cast these pieces and they are specific to certain things but they remind me of re-appropriated or found materials. 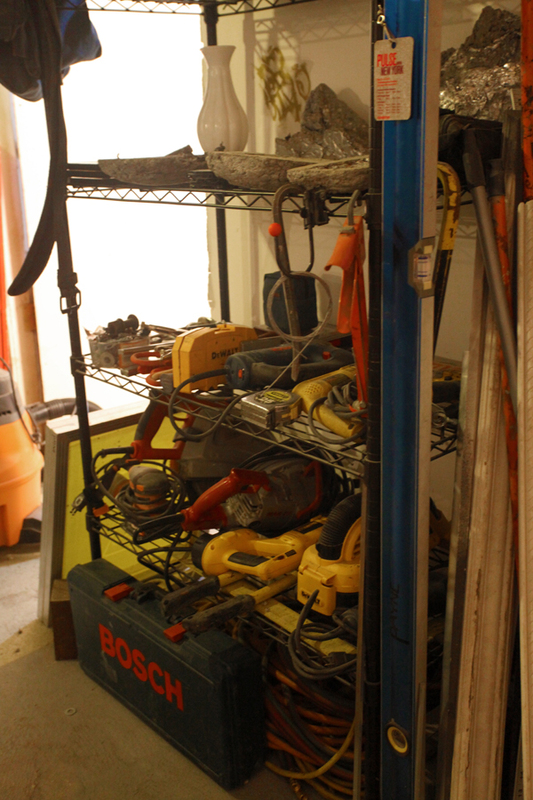 JP: They are construction materials – like the molding. It’s molding but it’s more related to the visual pattern. They might become more structures or armatures for the concrete work. F: The series was on the ground before. This is the first time I’ve seen them leaned up against the wall in this space but they are still very much objects. I find that they are completly different from your other work. I don’t know if it’s the red clay material that makes it seem that way. JP: The patina allows you to see more of the pressure and weight of the material in these. 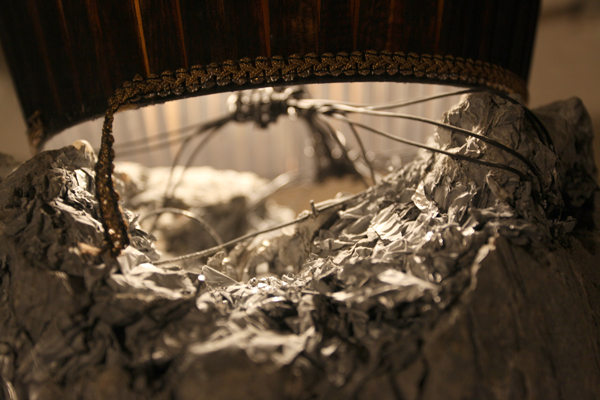 They are more like frames in a way in terms of how I constructed them. The interiors of these comes from the center. Originally I saw them as more wall pieces but I see them as something bigger. You can find more of James Payne’s work at www.jamesedwinpayne.com.